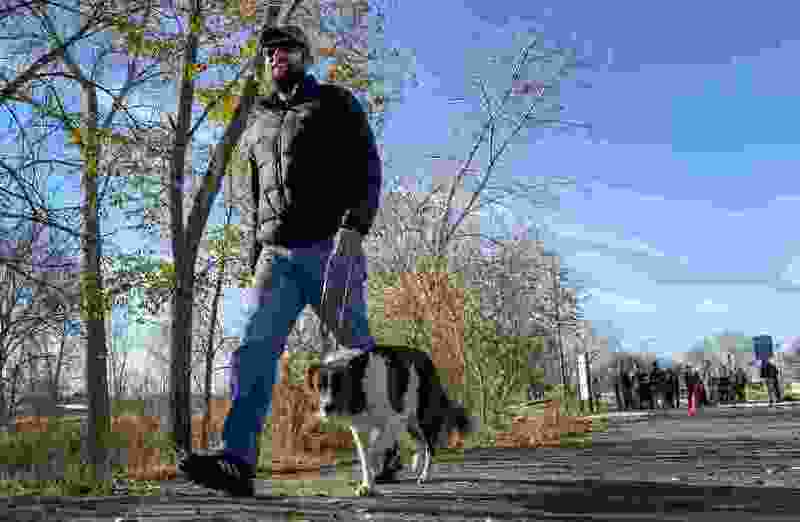 (Leah Hogsten | The Salt Lake Tribune) "I am super stoked about Tracy Aviary," said Bob Gray, who stopped to hear about the changes to Jordan River Park at a press conference before returning to a walk with his dog, Penny. Gray, who walks the river trail daily said "something like this has been needed" for the river corridor. The Jordan River Park will be expanding to prioritize preservation of natural habitat, more recreation opportunities and better accessibility under the newly proposed Tracy Aviary's Jordan River Nature Center, announced Monday, Nov. 26, 2018. Salt Lake County marked the beginning of its process to create a new park on the Jordan River — a “truly unique” development that will include a partnership with the Tracy Aviary and will work to preserve the natural landscape while offering more recreational opportunities. The county’s planning for the proposed park, which will stretch along the river from State Road 201 to 4500 South, is expected to take two years, with several public meetings and public engagement on the project beginning next spring. Construction for a new aviary building is expected to begin in 2020. “As a community, we have made significant investments in the Jordan River over the years, and we do this in recognition of the importance the Jordan River is in our community and our state,” Salt Lake County Mayor Ben McAdams said at a news conference on Monday. He and others involved in the project portrayed it as a “continued investment” in the river and its surroundings. The project already has $490,000 in dedicated state funding, which was recommended by the Jordan River Commission, according to Michelle Schmitt, a spokeswoman in the county mayor’s office. That includes $175,000 for trail construction between 3300 South and 3900 South; $148,000 for the Aviary’s transitional center and to start a bike-share program; $75,000 for Aviary program staff; and $92,000 for invasive species management. 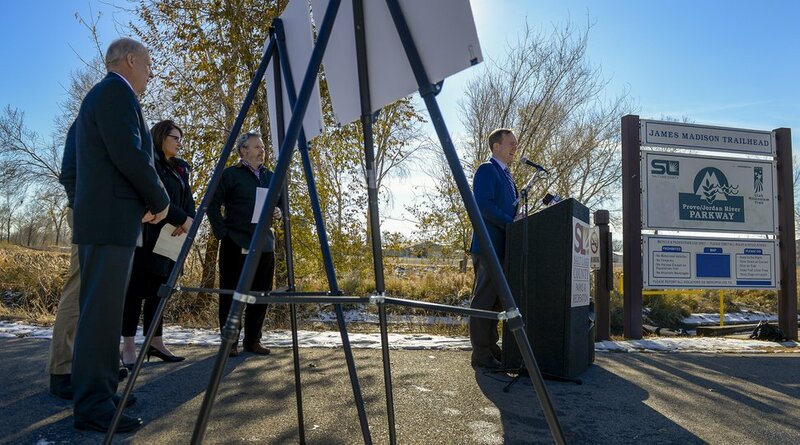 Leah Hogsten | The Salt Lake Tribune Salt Lake County Mayor Ben McAdams gives details about the proposed nature center and master plan Monday, Nov. 26, 2018. The Jordan River Park will be expanding to prioritize preservation of natural habitat, more recreation opportunities and better accessibility under the newly proposed Tracy Aviary's Jordan River Nature Center. Master planning will include an assessment of the geographic area and existing amenities as well as outreach to community groups and local governments. A number of public officials from across the county were present at the news conference to demonstrate their support for the project — including South Salt Lake Mayor Cherie Wood, Millcreek Mayor Jeff Silvestrini, Taylorsville Mayor Kristie Overson and West Valley Mayor Ron Bigelow. Tim Brown, the president and CEO of Tracy Aviary, said the new Jordan River Nature Center will operate as a second campus for the organization, complementing its efforts to further education and conservation in the county. The organization will work to connect people to the environment at the center through outdoor recreation, including ropes courses and canoe and bike rentals, he said. The river is home to an array of native wildlife and provides “a critical resting area for migratory birds as they travel from Canada to Central America across the Central North American Migratory Bird Flyway,” according to information from the Jordan River Commission. Bob Gray, who stopped to hear about the changes to the Jordan River Park at the press conference before returning to a walk with his dog, Penny, said he is “super stoked” that Tracy Aviary will be involved in the development. Gray walks the river trail daily and added that “something like this has been needed” for the river corridor. As the county moves forward with the project, it will also launch an “ideas competition” to collect ideas that could be incorporated into the plan for the area. Details about the competition haven’t yet been finalized but are forthcoming, Schmitt said.